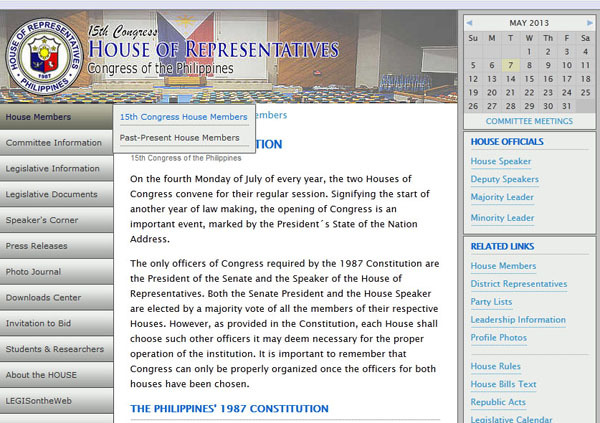 Have you chosen your Congress Representative? When I was a kid, I spent some time in Bulacan to campaign for Tita Jose dela Cruz who was then running for Vice Governor. She happens to be the sister of my Tito. 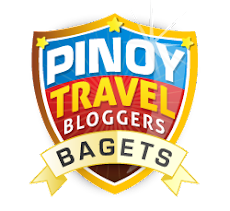 Fast forward to 2013 and my Tito Pete is running for office as well. Since I’m working and can’t campaign full time I spent almost 2 weeks (1 month apart) volunteering for his (Doc Pete Mendoza) campaign for Congressman in the 2nd district of Bulacan. I listened intently to his platform and picked up a few things that could help us decide who to vote for Congressman. There are numerous ways to check on your candidate but I’m sharing just two. If you want to know what your representative has done in congress, this is a quick and enriching read. As a normal citizen with no direct ties to my local government, I wasn’t aware that I could easily do this – check on what my representative has done. This is a simple way to check and is open to anyone. It’s not like we obtained this information secretly or through an “insider”. 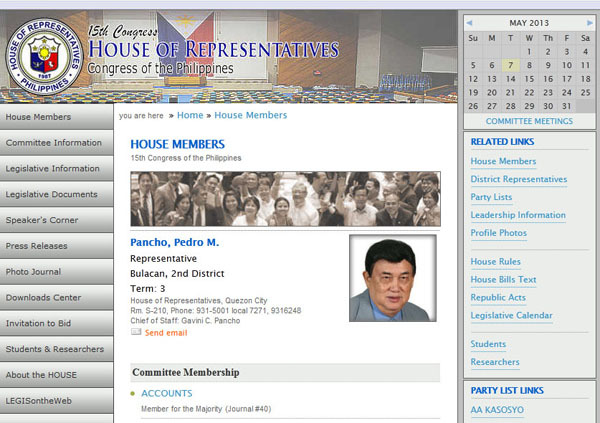 On the left hand side, look for the “House Members” tab and click on the “15th Congress House Members.”. 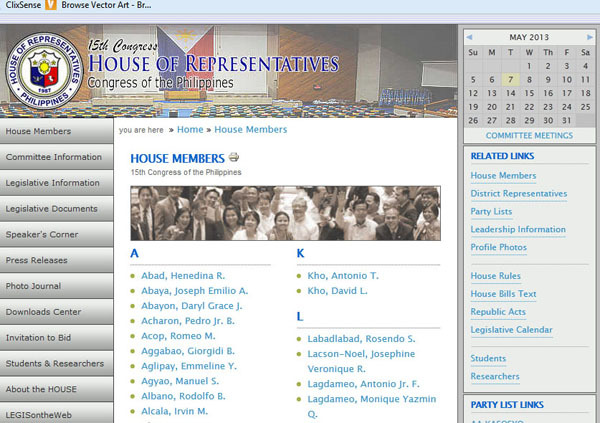 This will take you to the complete list of Representatives in alphabetical order. 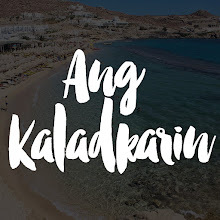 Click the name of the representative you would like to check out. The representative’s page will show you the following: name, district, terms in office, committees involved in and most importantly House Bills filed. You will see how busy your representative is in congress and the topics he/she usually supports. 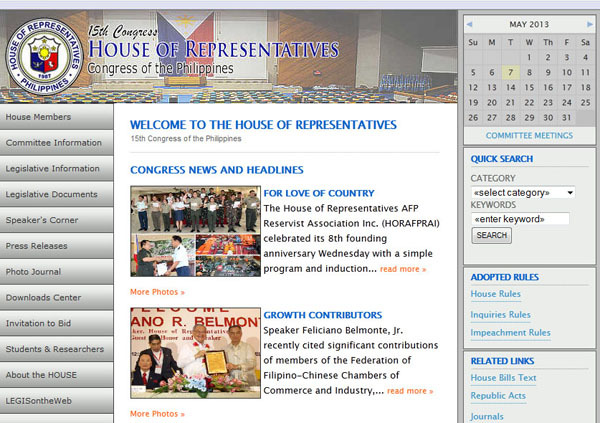 For example, in the photos above you will see that Cong. Pancho has been in office for 3 terms straight and has sponsored 9 measures. The RH Bill is important to me and it’s another way to check on your representative. 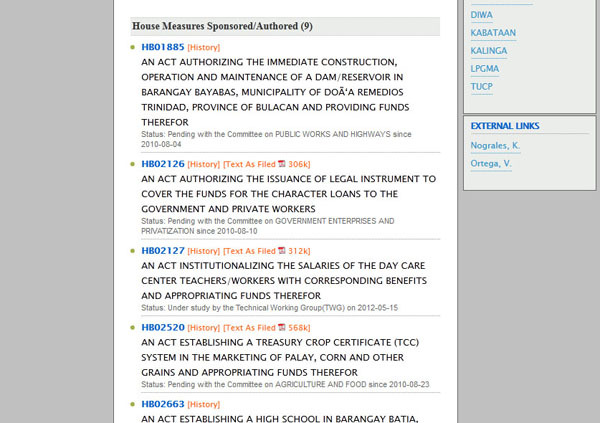 If you have a strong opinion about the RH bill like I do, this LINK lists down how our representatives voted. My next post will be about the Senators!